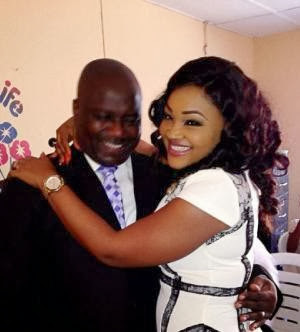 Mercy Aigbe steps out smiling amidst marriage breakdown as her husband denies beating her..
Reports that Mercy Aigbe and Lanre Gentry's marriage had hit the rocks hit the press a few days ago with allegations of adultery on Mercy's part and domestic violence on her husband's part. 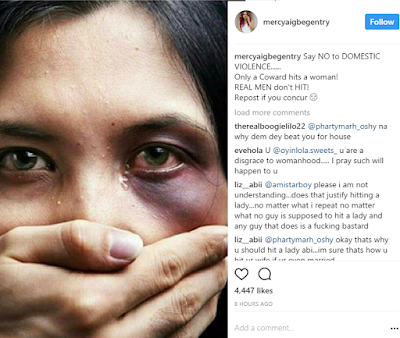 Mercy shared the image above right before the news hit, a post against domestic violence which gave more credibility to the reports that indeed her marriage had crashed. The couple then had to do a video debunking both allegations.. This time around Mercy was said to have been battered by her husband amidst allegations that he was now seeing Mercy's friend a certain Opemititi AKA Queen stunner..
Mercy has not denied the allegations nor accepted or released any statement in that regard. He says he loves his wife and that he never hit her.. 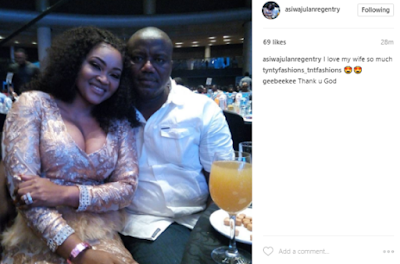 It is not clear if this is a recent image of Mercy or just a PR stunt to counter reports of her being battered to the extent that her face was unrecognizable!